Sky Tonight—May 16, Will you see a fuller moon tonight … or tomorrow? Your calendar probably says that full moon is tomorrow, Tuesday, May 17, 2011. However – depending on where you live and what time you look – you might see a fuller moon tonight. That is true for us in North America. Full moon falls at or shortly before dawn on May 17 for us. So tonight’s moon is slightly more full than the moon tomorrow night – even though the calendar says that tomorrow is the full moon. This happens pretty frequently because astronomical almanacs typically tell the full moon time in what’s called Universal Time – standard clock time at Greenwich, England. For us in the Americas, Universal Time (UTC) or Greenwich Mean Time (GMT) is some hours ahead of our clocks. At this full moon instant, the moon will swing most directly opposite the sun for the month. It will be the crest of the moon’s full phase. At every full moon – for half the world – the full moon is under the horizon during the daylight hours when it is most full. This month, that is the case for Europe, Africa, most of Asia, and most of South America. If you are in one of those places, the moon will appear about equally full tonight and tomorrow night. In contrast, if you are across the International Dateline from the Americas, the moon will be most full after sunset tomorrow. That is you if you are in Japan, the Philippines, Australia, or New Zealand. If you are going to plan a full moon party, it is best to plan it for the day or two before the calendar says the moon will be full. Then you can be sure of finding a bright, nearly full moon in your sky when the sun goes down. That is because a full moon always rises at sunset, and the moon rises later every day as it orbits Earth. Therefore, the day after full moon, you could wait nearly an hour after sunset to see a moonrise. To know when the moon is fullest for you, you have to convert Universal Time to the clock time in your own time zone. How do I convert Universal Time to my time? 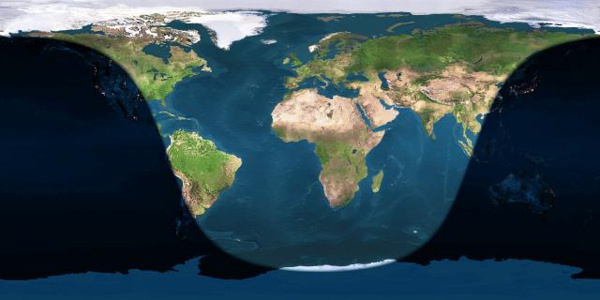 The world map below helps you to envision the day and night sides of Earth as the moon turns full on May 17 at 11:09 Universal Time. No matter where you live, however, look for a full-looking moon to rise over your eastern horizon after sunset tonight and to sit low in the west before sunrise tomorrow. 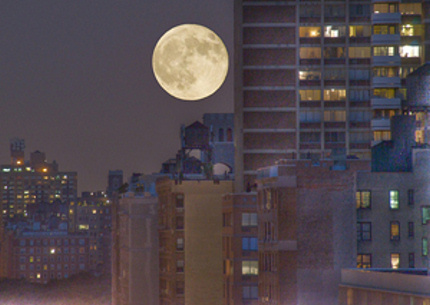 Watch the big, round moon light up the night from dusk until dawn! World Map, courtesy of John Walker’s Earth and Moon Viewer. Site contents copyright © 2019 Recorder Online	except as noted. All rights reserved. | 86 queries in 2.412 seconds.